In February, the temperature of the air in Rome is deceiving. While a thermometer may indicate 11º C, the physical experience may range from the comfort of a sunny café to a bone-chilling shiver of a shadowy stone passage. At this time of year, it is radiant heat that matters – the penetrating chill of cold stone demands a kind of insulation that the clothing industry has not addressed. Layering has its limits against the relentless absorption of our metabolically -generated warmth by the seemingly infinite absorptive capacity of several meters of brick, marble and limestone. Radiant heat is mysterious, not easily measured by conventional thermometers that register the rate of vibration of air molecules, or sensed through our fingers when we hold a hot coffee – but is perceived remotely, of sometimes obscure origin. Like the sense of smell, we have little language and few measuring devices to describe the phenomenon, but we are incredibly sensitive to even small variation. Like sound, it is inherently spatial. The intensity of radiant heat diminishes by the square of the distance between the source and the observer, so we become unconsciously attuned to the relationship between space and heat, reflected historically in the organization of domestic patterns and public rituals. The Piazza della Rotonda bristles with tourists enjoying a window of late winter sun, picnicking on the fountain, claiming the sunny seats in the outdoor cafés, standing in small clusters awaiting instructions from their leaders. Unlike the sweltering hoards in August, they can afford to linger and relax, warmed by a sun approaching its equinox, regaining its strength for the coming spring. As recommended by all the travel guides, they dress in layers, allowing some ability to adapt to the inevitable morning and evening chill, making it possible to survive the exhausting rituals of cultural enrichment. With weakening cultural determinants for appropriate dress, T-shirts brush against fur coats amid a flock of students in coats of synthetic fleece following their shepherd with an umbrella for a staff. Fifty meters away, an imagined center of the universe was marked two thousand years ago, and remains there nearly intact. It appears to be embedded in the earth, marking a particular moment in the vertical layering of the city beneath the present vias and piazzas, a relic in the sedimentary process of urbanization like a stone on a sandy beach creating its own moat by accelerating the erosive forces around it. Fragments of buildings of uncertain provenance, perhaps the Baths of Agrippa and the vestiges of medieval houses, adhere to its walls. These walls express clearly of the structural innovations of sophisticated unadorned masonry, having long since been stripped of their refined cladding in the service of subsequent powers. In the absence of the self conscious language of architectural representation, the mass of the building speaks to the city with a profoundly eloquent guttural croak. At the intersection of a vertical axis from the sky to the ground and a horizontal axis from the city to the individual, the Pantheon constructs a temple to the relationship between the ordinary and the universal. The idealized universe represented in the perfect geometries of the interior is connected to the world through two portals, one an oculus to the sky, the other a portal to the city. The oculus is open, an 8 meter wide hole to the vicissitudes of nature, contradicting the conventional demands of a roof. That the largest masonry dome ever built on the planet would not perform the most fundamental requirement of shelter from the elements is the first clue that this is not a work for earthly purpose. While the bronze that once covered the roof was melted into use as columns to crown the tomb of St. Peter and cannons to continue his fight, the massive bronze doors have remained in operation over the course of two millennia. They are more than an ordinary threshold between inside and outside; they connect two realms of human experience at the joint between the sphere inside and the city beyond, between the circle and the circus. At one celebrated moment, corresponding to the mythical date of the founding of Rome, the skewer of sunlight formed by the oculus penetrates the door in perfect alignment, uniting the origins of the city with its ultimate progenitor, the source of all earthly energy, the sun. The monumental porch extends the passage, belonging to both the city and the temple. The dense field of stone columns, derived from the Greek pronaos, prepare the transition from the body-scaled rituals of the piazza to the universal harmonies represented on the other side of the great bronze doors. Architects flock to experience the perfection of the sphere implied by the dome; serious tourists contemplate the experience of wonder promised by the guide books; foreign students wake their friends back home with a cell phone call announcing where they are calling from. The dimension of human occupation is contained in the lowest 4% of the building’s height- the experience of temples, basilicas and cathedrals is remote rather than direct. A cylinder of light pierces the oculus, tracing the progress of the sun across the coffered dome, remaining this day in that semi-spherical representation of the cosmos that has been repeated in all the domes that followed this one. Standing at the center, under the oculus, above an enigmatic bronze mask with two elliptical vacant eyes leading to an uncertain void below, one can feel in one’s feet the arc of tangency of the virtual half of the dome’s implied sphere, containing only you, your family, or small group into the universal orb. For a moment, your position on the onion skin of the earth’s surface is connected through the vertical axis of this sphere, the axis mundi, from the heavens to the center of the earth. While the few guides regale tourists with stories around the stations of the circumference, repeating twenty different translations of the inscription on Raphael’s tomb or recounting his tempestuous love life, it is at the empty center, where Rome’s accumulated iconography, patterns, symbols and texts are absent, that space, a knowledge of your place in the world, rather than all the surface representations, speaks with profound clarity. All of the texts that attempt to explain this experience through the analysis of geometry or wonders of Roman construction, privileging the fundamentally visual underpinnings of Western culture, cannot prepare you for the next sensation – a deep, penetrating chill that you feel in your bones. Perhaps it is simply the reallocation of energy as your body digests the lunch taken earlier in the warmth of the piazza, but you sense the cold as a void from another depth, and perhaps another time. The source in not distinct, since the air temperature does not seem to have changed significantly and the chill does not appear to be coming from any particular direction. It is a primal chill, working from the inside out, as the energy generated by the body’s metabolism is aggressively sucked out of it. It is not unlike the cold on a clear, late summer night, when the black sky becomes an infinite heat sink, chilling every exposed surface enough to form dew or even frost, the damp warmth of the atmosphere giving up its power of retention to the darkness of space. But in this case, the cold seems to come from within the earth, within this building made from the earth. If one were to dig into the earth, as little as five feet in temperate climates, to the levels where the ruins of ancient civilizations remain unexcavated, the earth is a constant temperature, about 8º C. We rarely encounter this thermal condition except in caves and grottoes that have been the salvation of civilizations that thrived in hot climates. 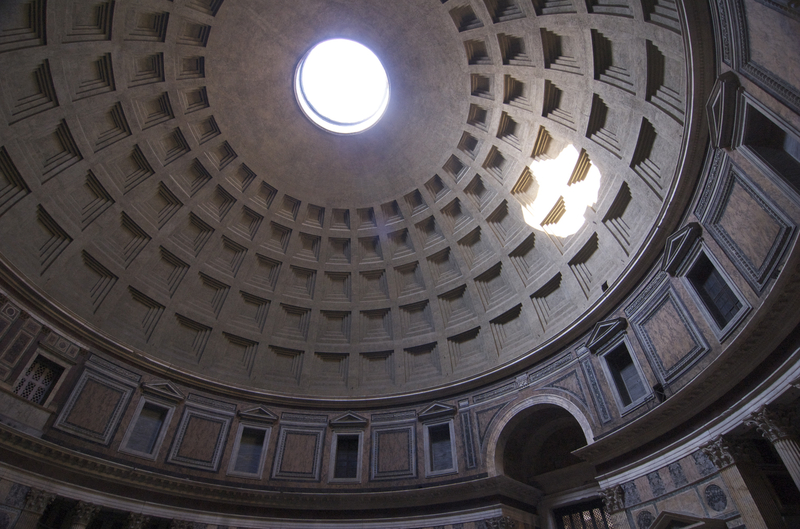 But the lingering recollection of a note in the guidebook, or an image of the section through the Pantheon, triggers a connection: the walls of the Pantheon are solid masonry, seven meters thick, the dome is solid concrete, tapering from six meters thick at the wall to two meters thick at the oculus. This is not a building but an earthwork, bringing the thermal memory of the earth up with it to envelop the space of human experience. This incomplete enclosure, simultaneously indoors and outdoors, is a space not just on, but in and of the earth. You see the traces of the sphere in the surface, but you feel the mass of its thickness viscerally. On this February afternoon, you are feeling the remembered cold of a clear November night- perhaps in June another visitor will experience the remains of February’s chill as a welcome relief from the summer heat. This place that employs Plato’s perfect geometries to escape the boundaries of time is also a great time machine, storing in its molecular structure the passing of the seasons, displacing time in its massive thermal capacity. The mass of the building acts as a great storage device, stabilizing daily and seasonal variations, a counterweight, like the conception of the architecture itself, absorbing and releasing all that is ephemeral and transitional. This place is stable relative to the continual change around it, but it would be a mistake to think of it as an isolated object, apart from the world. The processes of absorption and radiation, both thermal and cultural, are entirely intersubjective – that is, a multidirectional dialogue between the work and the world, in constant flux. Some dimensions of this engagement can be described in the physics of thermal mass and infrared radiation, others demand an understanding of the multiple ways of constructing cultural value. Why, of all that was once Rome, has this one work survived intact? It is part of a continuity of fluid processes in which materials are in constant motion over spans of hundreds of years, in continual rhythmic flux through days and months and seasons, where meanings accrue, gain currency and fade upon an armature both physically and conceptually strong enough to demand perpetual human engagement. In a city of tourist icons, the Pantheon remains curiously apart, part of the fabric of the city, without entrance fees or lines, security checks or elaborate explanations. It is a place one revisits many times, if possible, to witness the changing world through the oculus – to see rain or snow in a new way, to lie on the floor and see the colors of the sunset for the first time. It doesn’t fit on a checklist like the Bocca de Veritas – because it is a different place at every visit. It is the world’s most exquisite camera, crafted to allow the framing the world in new ways rather than present the vision of a single artist. Like the camera, it exists between the observer and the world, a mediator rather than subject or object, storing the history of its interaction with the world and releasing the latent images, latent energies and latent stories to attentive witnesses. Time and temperature are the originating force of architecture. Heat is the measurable manifestation of energy, the sole ingredient required to overcome entropy. Every treatise on architecture tells a story of beginnings, in some way explaining how energy forces beyond our grasp are brought under human control. Each act is determined to transcend a dimension of time, and all become dependent on each other to construct the space of rituals that define distinct cultures. Four acts recur and find expression in almost every text: marking the ground, making fire, constructing a boundary and framing a set of relationships. In the sequence of activities that are reenacted by every hiker who sets up camp and shares a meal, the primal acts of preparing the site, generating warmth, insulating against the elements and communicating with another person, are reenacted and re-presented in every work of architecture. Whether the heat source is the retained warmth of a south-facing outcropping, the chemical release of photosynthetically embodied energy in the burning of a log, or the release of a million years of pressure that transformed a carbohydrate into an energy-rich hydrocarbon, its purpose is bring the world and the body together in a web of individual climates. The average temperature of the earth is about 15ºC. Humans balance their heat output and absorption at about 20ºC. Globally, the reorganization of landscapes and formation of cities, wars fought over resources and our challenges concerning energy in the future can be traced back to this small difference. Our architecture, cities, cultural rituals and institutions exist to reconcile this difference in time and space, to allow us to inhabit the vast range of climates and dynamic variations that comprise the range from which this average is calculated. A change of a few degrees in either direction would radically disrupt the web of relationships that have developed to bridge the gap, lending a pressing urgency to the reconsideration of how humans have been handling this reconciliation.